Click here for the retreat with John de Ruiter in Bad Meinberg, Nov 2018. Live recording of an Open Mic Gathering with John de Ruiter from Netanya Retreat in Israel on Saturday, April 30, 2016. John de Ruiter: About "Who Am I"
In this video clip from the Tiruvannamalai live meetings and live streams with John de Ruiter, the questioner asks about Sri Ramana Maharshi’s process of self inquiry, asking ‘Who am I?’ and the connection to John’s teaching. Dialogue with John de Ruiter on January 28, 2015. In this interview from 2015 John de Ruiter speaks about the basics of his teaching. What is awareness? How to open your heart and transcend your self? John de Ruiter explains how an open heart and relaxed awareness, the elements of his meetings, open deeper levels of consciousness. Qu. 1: How to Open Your Heart and Move into Deeper Levels of Awareness? Qu. 2: The Conscious Mind and Unconscious Mind are the Self while the Heart is Self Transcendence. Qu. 3: Awareness Naturally Relaxes. Qu. 4: The Way to Enter Your Being is by Opening Your Heart. Qu. 5: Why Don’t We Remain In The Level Of The Being? Qu. 6: Integrating The Self In This Life. Qu. 7: Finding Meaning in Life from Day to Day. Qu. 8: What Is Happening In Your Meetings, John? Qu. 9: What Is Meditation? Are John’s Meetings a Form of Meditation? Qu. 10: How Does John’s Teaching Apply To Sick People or Health? Qu. 11: John de Ruiter’s Teaching In A Nutshell. An informal gathering with John de Ruiter in Osho Leala, Gillingham, UK. A meeting with John de Ruiter in Copenhagen. John de Ruiter about consciousness and reality. Video from an seminar in Freiburg (Germany) 2013. 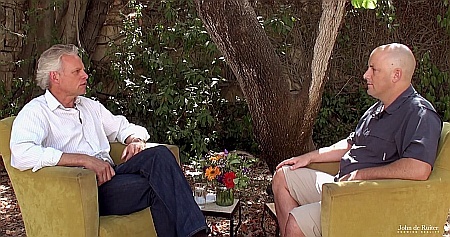 Interview with John de Ruiter by Rabia, at the Neve Shalom - Wahat Al Sallam (Oasis of Peace) Retreat Center in Israel. Here you can watch a recorded live-webcast with John from Dec 2012 from Israel.